After a short break we are back with new and updated topics covering the period Nov 2017-Jan 2018. Included are entries for Western Australian ceramists Bela Kotai and his father Ferenc Lajos (Francis) Kotai. Surprisingly, we don’t yet have an example of Bela Kotai’s mark so if you know how he signs his work, please let us know. Illustrated: Colin Lacrosse’s impressed tree mark. 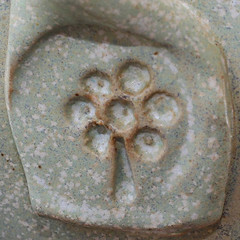 I’m trying to identify a lovely piece of pottery and I have photos. …can you do this for me?